Description: Stock Photo of a Red Flower of The Oregon Coast. 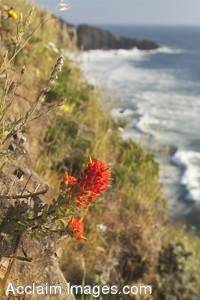 This picture shows a red flower growing from the rugged terrain of the Southern Oregon Coast. This photo is available as an art print or poster and may be licensed as stock photography.